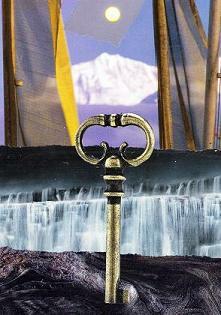 The Key, collage, SG, 2010. The next days were a never-ending excitement. It was agreed that Vivian and Corwin would pagmoo to the main continent, and stay a few days at the Elven “norn” Gundasä (Goon-dah-seh), close to the coast. From there, Vivian would first pagmoo back to the Guild Halls and then return with Molly Malone´s wagon, which contained all the gear necessary to later be in permanent contact with Blaise who, due to his various duties as Headmaster, would stay at Caer Abred on Druid Island. They discussed going into the woods directly with their pagmoo, but Corwin remarked, quite aptly so, that it was better to ride into the Overlord´s territory as slowly as possible. No need to create a scandalous disturbance which would only provoke hostility. Neither Vivian nor Corwin had any idea of what to expect after the first, more agreeable part of their trekking up the civilized side of the Gelden River. They were not very worried about it since both of them carried a pagmoo that would probably get them out of any nasty situation fast, should it happen. Their first goal was to approach the forest, and, if possible, get into contact with the Overlord, who would know where the copy was kept. There was no other route into the Darkwoods, a place which wasn´t exactly described as Traveller´s Delight. From Norn Gundasä they would ride along the Gelden River, up to Dunbar´s Crossing, then cross the Gelden and at that point go into the deep forest of the Darkwoods, of which little was known, apart from the pall of dread that surrounded it. The Darkwoods, so named for the obvious reason that it is a primeval forest, were inhabited by strange creatures, it was said. Not to speak of the Overlord whom no living Elf had ever returned to speak about. The legends were terrific, telling of peaceful travellers eaten alive by monstrous beasts and disappearing without leaving a trace, not to be seen ever again. Were it not for their mission, Vivian thought, I wouldn´t touch the Darkwoods with a long pole, a very very long pole. Thankfully, Molly Malone´s wagon contained every possible comfort, including a small sound shower. And above all, it boasted a superb and fine-tuned communication center, through which they would be in constant contact both with Master Blaise at Caer Abred and with the Elven scientists at Norn Bel who had deciphered the copy of the Khandroma parchment. The trek to the Darkwoods would be a first for both Vivian and for Corwin.